This TEDx Reno event was held on April 26, 2013 at the Nevada Museum of Art. 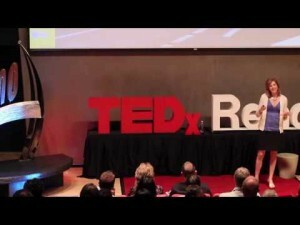 I had the great pleasure back in April of participating in a TEDx event at the Nevada Museum of Art. My complete talk can be viewed here but in short, I spoke about how and why to make our cities more walkable, mostly using examples from downtown Reno, the city where I live. They may be iconic or otherwise well-known spaces that are most closely identified with the city, and therefore, in the minds of many, come to stand for the entire city, for good or bad. They may be at a physical crossroads, located between other desirable areas, making it critical that they be made both appealing and safe, to turn disconnected “pockets of walkability” into cohesive corridors. A Reno Arch has stood in the center of downtown Reno since the late 1920s, and the area is still the city’s most recognizable spot. 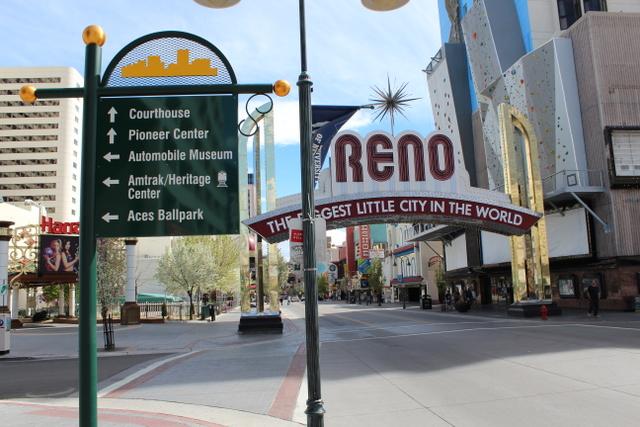 Reno’s central casino core fits both of these criteria; not only is it the home of the city’s most iconic image–the Reno arch–but it is the area most traveled by and known to tourists. 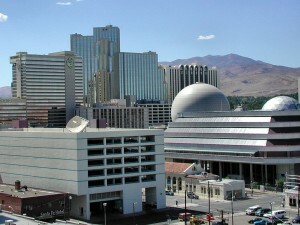 Even more importantly to its residents, the casino core is directly at the center of four popular and walkable districts: the University of Nevada (to the north), Truckee River/Midtown (south), Aces ballpark and the emerging shops/restaurants/clubs of Fourth Street (east) and thriving Riverwalk district/kayak park (west). In the effort to make such areas more walkable, I suggested a need to consider three primary factors: variety, scale, and connection. In terms of variety, the environment needs to ensure variety in appearance, function, and people. Basically, it needs to attract a variety of people all hours of the day–shoppers, businesspeople, families with children, tourists, and residents. That’s the only way a place can feel both safe and authentic. So what to do? Encourage and support a variety of businesses, particularly development that caters to different uses at different times of day–street-level business with apartments above; live/work spaces, coffee shops, restaurants, museums, retail of all types. Parking garages dwarf pedestrians, and those potted trees do nothing to enhance walkability. The scale needs to be people-friendly; no one enjoys walking in a space that seems tailored for cars. Parking garages, block-long solid edifices with no individual storefronts or visual interest…these are both soul-deadening and dangerous, since they offer no opportunity to create a constant movement of people in and out of city blocks, adding a constant influx of pedestrians to the sidewalk. Street-level retail adds visual interest to parking garages, and attracts a variety of people to a block’s various storefronts. This stretch contains a restaurant, a combination visitor center/popular retail shop, a post office, and more. Connection means paying attention to how pedestrians use these spaces, in order to encourage greater use. Create attractive anchors that can visually draw people from one destination to the next. Make walking enjoyable. If you need parking garages, at least place commercial storefronts on street level (and why not do that in the hotel-casinos, too? ); make sidewalks functional; prioritize infill projects to eliminate shadowy vacant lots and deteriorating properties that make people uncomfortable and can promote undesirable activity. It’s amazing how far people will walk if they find the experience enjoyable and safe (we’ll walk for hours through a shopping mall–the equivalent of several city blocks–and yet often balk at having to walk two blocks from a parking space to a restaurant!). When you consider walkability your primary goal, you can see potential everywhere. Every building is full of possibility. You may be thinking hey, that sounds great, but I’m not an urban planner, or an architect, or a business owner who might want to relocate to one of these areas–so what can I do? Easy. Go to these critical areas, park your car and walk around. See what’s already going on down there. Take a walking tour. Support the effort. Tell other people about it. Pay attention to what is being proposed in these areas, and ask yourself if it meets these criteria. Participate in the process. When walkability is the goal, you literally carry the solution with you, in your own two feet. I’ve been thinking a lot lately about walking tours. I’ve led a handful of tours of Reno over the past few years at the request of various groups like Nevada Humanities, and have plans to lead another one this summer. While countless places, large and small, offer well-attended tours on a regular schedule, walking tours in Reno are still something of a novelty. 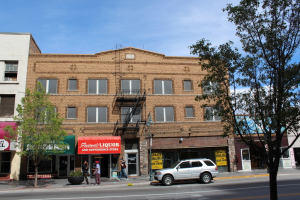 The terrific Historic Reno Preservation Society (HRPS) offers a number of popular and well-researched historical tours of various neighborhoods throughout the year, but they’re the only group offering directed tours of Reno on a consistent basis. There are self-guided options, of course. When I served on the City of Reno’s Historical Resources Commission, we developed a historic walking map that’s been reprinted several times and has been posted online. It’s a great resource, but there’s no way of knowing how many people actually use it, or how much they feel they’ve learned when they do. Right now I’m working with the Special Collections department at the UNR Library to build a new smartphone app and website with a collaborative team of area archives and organizations (including HRPS) to provide a place-based, multimedia platform offering accurate information about the city and its heritage. With capacity for video, audio, photos, and text, it’s going to be the next best thing to following a guide around, and I’m thrilled that it’s finally going to happen (more posts on that soon). Still, there’s something unique about a real, live walking tour. 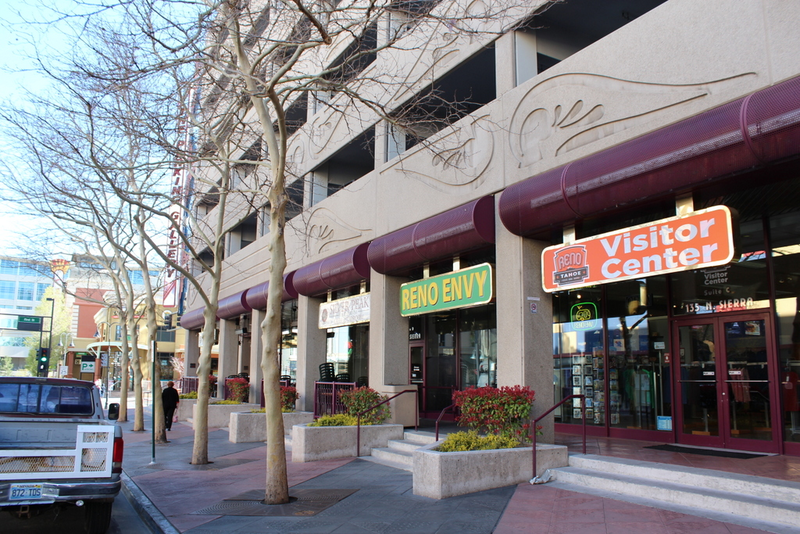 For me, walking with groups through downtown Reno is enormously gratifying. Since I’ve devoted years to researching Reno, I can deliver a lot of information about its history, but I find that a lot of what I end up doing is explaining why downtown looks the way it does today, to fill in the blanks. Central Reno changed significantly in the mid-to-late 1970s, when shifting economic priorities transformed the city core from a diverse, pedestrian-scale mixture of retail, commercial, and tourist-oriented businesses (left) to a landscape dominated by block-size casinos, hotel towers, and parking garages (below). It’s a confusing environment, where historic structures are dwarfed by gaming properties, and interpretive markers are few and far between. Leading people through this landscape and answering their questions helps to lend it some coherence. It’s not always comfortable. When you walk through the heart of downtown Reno, you run into all sorts of people, some apparently homeless or even suffering from mental illness. There are some seedy souvenir shops, but there are also beautiful architectural details that can only be appreciated when standing directly in front of them. There are gorgeous interiors, too, like the waiting room inside the historic Southern Pacific Depot, a true gem that was just listed in the National Register of Historic Places. And the Riverwalk District, a collection of local-oriented shops, restaurants, and entertainment venues just south of the casino core, is starting to hit its stride. Every time I’ve led a walking tour downtown, curious passersby stop to listen or even tag along, which shows me that people are thirsty to learn more, to make some sense of what they see. Is there tourist demand for Reno walking tours? Perhaps. But local residents might get even more out of touring their own habitat, as encouraged by the inspired Los Angeles Urban Rangers. Residents worry a lot about the city’s image, but to me, improving the landscape has to come first. 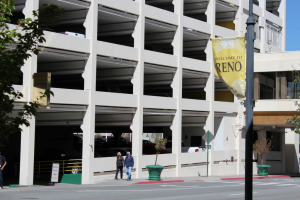 In my mind, the key to reviving downtown Reno will be restoring its walkability, to bring back that pedestrian-friendly mixture of buildings and businesses that will once again attract residents and tourists alike, creating vibrant shared spaces that will feel safe and welcoming to everyone. If we want people to be more comfortable with our downtown, we need to get more comfortable with it ourselves. And taking the opportunity to stroll along its sidewalks with a trusty guide for an hour or two could be an important first step.